There’s an art to making a good tortilla, and I’m not sure I’ve cracked it yet (although I’ve cracked plenty of eggs trying). It’s the sort of thing where even the most detailed recipe is no substitute for being able to sense when you’ve got it right. Even if they aren’t up to the standards of the average Spanish tapas bar (can I do those rounded edges? Can I hell! ), I have been pretty satisfied with my last couple of attempts. The key points are a) the correct ratio of eggs to potatoes, and b) the right sized, heavy frying pan. I reckon you need about one medium potato per egg, but really you need to look at the mixture and know whether to add another egg. It should be neither too eggy (it won’t hold together) nor too packed with potato (too stodgy). The mixture should fill the pan to a depth of between 1 and 1 1/2 inches — thin tortillas are hopeless, and if it’s too thick it will scorch before it’s set in the middle. Some people slice the potatoes, others cube them. I’m in the “slice them” camp at the moment, but I may change my mind. The onion is essential — it will be too bland without. The end result should be firm enough when cold to cut into wedges or squares and eat with your hands. At the same time it’s not nice if it’s so overcooked it’s gone leathery (another reason not to do a thin tortilla). This is a recipe I received from Jim Fisher of Cook in France. We didn’t actually make it when I was there, but he mentioned it and I was intrigued, as I knew that by the time I got home our friend Magali would have delivered half of one of her lambs, raised on the mountainside only a few hundred metres away from where we live. Normally, we’d have gone out for a wild asparagus omelette on Easter Monday, to which all the village is invited, but due to circumstances beyond our control, it had to be cancelled. So it seemed like a good opportunity: we invited eight friends and got cooking. The reason I say it’s “sort of” 30 minutes is because it only spends half an hour in the oven, but you need to put it in 2 hours before the meal. Our guests ended up being late and then we spent a long time drinking aperos, as you do in the Midi, so it ended up getting to the table about an hour later than our calculations had allowed for. Not a problem — it was delicious! 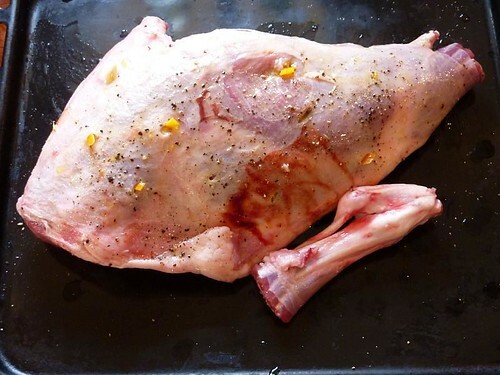 This is an excellent way of roasting a leg of lamb, and I think I’ll always do it this way from now on. Apart from the flavour and the energy savings, the other big advantage of this method is that the lamb comes out of the oven very early, liberating it for other things (a gratin dauphinois and some roasted vegetables in our case). 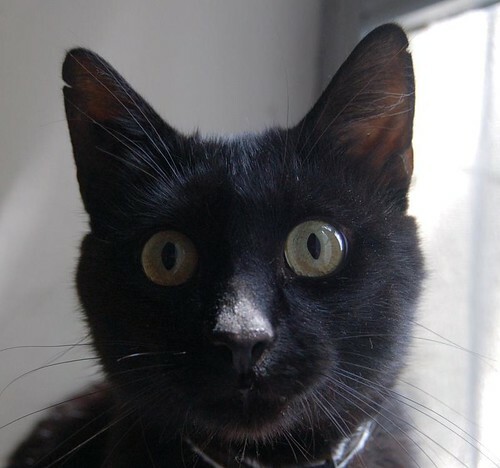 And as our experience demonstrated, it is very tolerant about timing. It was Eliza who inspired me to try the vintage feast idea in the first place, so I don’t know why I’ve waited so long. The official “challenge” is over, but I like these old cookbooks so much that I have decided to continue an occasional series. The book I have is an old Penguin, The Best of Eliza Acton, published in 1968, edited by Elizabeth Ray and with a foreword by … who else? Elizabeth David. You can’t read much Elizabeth David without discovering that she and Eliza are kindred spirits. Jane Grigson drew on Acton heavily for her English Food, and both she and David clearly thought more highly of Eliza than of the better-known Mrs Beeton. Modern Cookery for Private Families was published in 1845, when Eliza was 46, and stayed in print for over 50 years. This 350-page paperback holds only a fraction of the hundreds of brief, precise recipes the original book must have contained. Her crisp prose, sharp asides, and succinct instructions that assume the reader is already a competent cook cannot fail to recall Elizabeth David, so it’s hardly surprising the latter admired her so much : “Over and over again,” she writes, “I have marvelled at the illuminating and decisive qualities of Miss Acton’s recipes.” Discussing the fact that Acton was eclipsed by later inferior writers, David suggests that it was because she was “a child of the eighteenth century …. living in the manner and writing of a style of English domestic life already doomed.” And she concludes, “Temporary eclipse has often been the fate of great innovators. In a way it is posterity’s compliment to genius.” And similarly, when the Jamies and Nigellas of this world have been and gone, Elizabeth David will still be with us. So after all that, what about the food? I was spoilt for choice here. All sorts of things tempted me: fried potato ribbons, which sound very much like rather fantastical potato crisps, cut in long spirals; jumbles; cheesecake with no cheese in it; the famous cabinet pudding. In the end I went for a very simple menu. To start: carrot soup. Eliza has two basic recipes for this, but follows them with a recipe for a variation: “Buchanan carrot soup (Excellent)”. With that recommendation, how could I not try it? It was delicious, deep orange with a zing from the curry powder, making it much more successful than Ruth Lowinsky’s bland 20th-century version. My only criticism was that I don’t particularly like the texture of cooked rice in my soup; when I reheated the leftovers for lunch, I liquidised it. Next up: Chicken Burdwan, which with a few adjustments could well become a regular standby for using up leftover roast chicken, and is an “Indian” dish that would certainly appeal to French people. It’s a feast of 18th-century flavours. For dessert, I found the potato pudding irresistible. Years ago we were served a dessert of tiny dishes of impossibly smooth potato puree flavoured with vanilla at my then-favourite restaurant, Les Feuillants in Céret (sadly now gone). It was fantastic, and potatoes are my favourite vegetable, so I was certainly prepared to try another potato dessert. Of course it was nothing like that creamy dish at les Feuillants, but it did seem strangely familiar. After a couple of spoonfuls I realised it was very like the bottom part of a Queen of Puddings. So next time I want to make Q of P and don’t have any stale bread, I might use potatoes instead. All of these were dishes I’d happily make again, so this is the best vintage feast so far. My adapted recipes for all three follow. The ingredients list looks long and daunting. But almost all of them are storecupboard ingredients or basics you are likely to have on hand anyway. And it’s an excellent idea to make it in advance. I cooked it completely several hours beforehand, then left it to sit and mature before liquidising part of it and reheating. The rouille, a spicy form of mayonnaise, takes minutes if you have a stick blender. This recipe is from Nadine Abensur’s excellent Cranks Bible. If you remember the ghastly wholemeal stodge Crank’s used to serve in the 1970s, it’s nothing like that. As this recipe demonstrates, the recipes are imaginative and heavily influenced by Abensur’s French and North African background. If you like Ottolenghi’s Plenty, you’ll like this, and I highly recommend it if you are vegetarian, cook for vegetarians, or just fancy meatless meals every now and then. You’ll probably have to search for a second-hand copy, but it’s worth seeking out. My choice for April was Delia Smith’s Frugal Food. My paperback, now a tattered mess of food-stained pages, loosely contained in a cover adorned with a photo of a fresh-faced, decidedly unglamorous Delia, cost me 70p in 1974. She actually re-released this book with minor updates in 2008, not long after the publication of her much-reviled How to Cheat at Cooking (a more radical rewrite of her first published book). The new version, undoubtedly brought out to cash in on the recession, was a large-format hardback with full-colour glossy photos, the cover adorned with a cabbage instead of Delia’s face, costing £18. Not exactly a gift to poverty-stricken cooks. I was a poverty-stricken cook in 1974, a student in London living in bedsits or crowded student flats. This book, along with Jocasta Innes’s excellent Pauper’s Cookbook, was rarely far from the stove, as its condition attests. I probably bought it because I regularly read and used the recipe column she wrote for the Evening Standard; I still have a looseleaf binder with many of Delia’s newspaper recipes pasted into it. 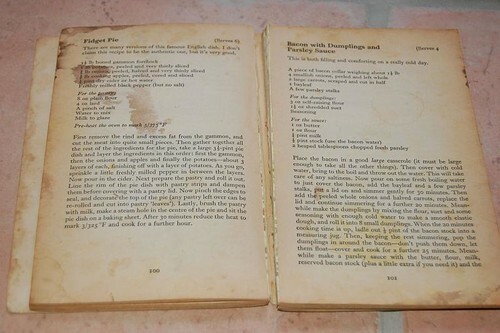 I don’t use the book now – the recipes are rather stodgy and earnest, a bit like Delia’s prose. Still, I thought it was worth getting out again. She had some sound ideas that stood me in good stead in those days – using cider in cooking instead of wine for example – and I still stick a skewer through baked potatoes so that they will cook more quickly. There are a few recipes here that became real favourites: fidget pie, made with scraps from a ham bone begged from the local butcher, rabbit in cider, steak and onions in Guinness, several recipes for offal, and, especially, chilladas – little rissoles made of lentils served with a tomato and chilli sauce (well, in my defence, it was the 70s!). Overall, the recipes aren’t much fun, but they are cheap, filling, and easy to cook. For my vintage feast, I decided to cook something I couldn’t remember having tried before. As I’m in cider country at the moment, pork braised in cider with prunes seemed like a good choice. It did turn out well, if a bit dry – but I think that’s because I used a pork loin roast, since that was what I had. It would have been better with a fattier –and cheaper! – cut of meat. What little sauce there was tasted excellent, belying its humble origins. 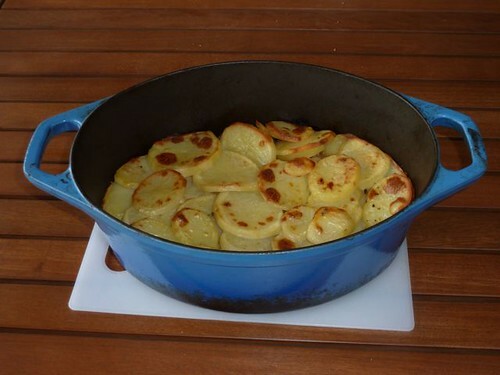 It’s a one-pot dish topped with sliced potatoes, but it needs some carrots or a green vegetable with it. To start, we had a simple carrot and leek soup, made with the stock from a pot-roasted chicken. The choice of puddings was rather limited and uninspiring. I ended up picking spiced apple bread pudding, because I had some apples and some stale bread, but we were underwhelmed. It wasn’t a patch on my classic eggy, rum-flavoured, sultana-studded bread and butter pudding; the apples just made a soggy layer in what should have been a creamy mass of custard-soaked bread. I’ve never been a huge fan of Delia, but having said that, there are a few of her recipes that I turn to again and again because they are so good, and she can be partly credited for teaching me (and probably millions of other people!) to cook. Her prissy, spell-out-every-detail style is a boon to unconfident cooks. Still, this book is evidently dated, in a way that her Summer Collection (the only one of hers I really like) isn’t – well, not yet anyway! It’s a reminder of how much better and more varied our food has become since then. It’s also a reminder that once upon a time most cookbooks just had recipes in them, not pages of arty photos, and were a lot cheaper! First a word about the book. 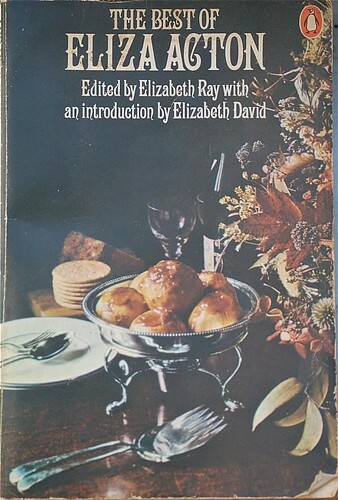 I am a huge fan of Elizabeth David, no matter how unfashionable she has become, and practically every modern British cookery writer owes a debt to her (often uncknowledged). Her French Provincial Cooking is required reading for any English speaker who wants to learn to cook classic French food. She doesn’t suffer fools gladly, and she happily assumes intelligence and competence on the part of her readers. But Spices, Salt and Aromatics… is not one of her best books. It’s bitty, parts of it cobbled together from a number of previously published articles, and not very coherent as a result. It’s hard to figure out, for example, what a recipe for paella is doing in a book ostensibly about English food! But that being said, this is Elizabeth David. Of course there are good things here, and masses of interesting snippets of information. The chapter on spices and condiments is inimitable David: a combination of the academic and the personal. 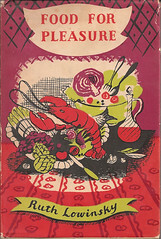 Using old recipe books as sources, she dragged many worthwhile recipes from oblivion and played her part in making people realise that English food was not without its own merits. Like all her books, it’s one you can read for pleasure as well as cook from. De Heem’s painting shows a seventeenth-century version of a Lombard crustade or pie, a survival from the fourteenth century, when such pies were common to the tables of the rich in Italy, France, England, the Low Countries, and Germany. This one, as the artist made plain by placing a dish of prawns in the foreground of his composition, was a fish day pie. The medley of dried and fresh fruit, almonds and pine kernels, probably concealed the main filling of fish, perhaps salmon and eel, or haddock and codling, ground to a paste with apples and pears, and ginger, cinnamon, cloves and mace. When the pie was baked the top crust was lifted, a mixture of cream and egg yolks, or for fish days a cream of almonds, was poured in. The cover was then replaced and, surmounted with its decorative cluster of pears, cored, filled with sugar and sweet spices, the pie was returned to the oven until the custard or cream had thickened. Recipes for Lombard or “lumber” pies survived in English cookery books, virtually unchanged, until well into the eighteenth century. Everything about these paragraphs, the precision, the careful use of phrasing and detail, the casual erudition, tells me they were written by Elizabeth David herself, not some Penguin editor. Just to encourage us, she adds, “Do not throw up your hands in histrionic despair when inferior ingredients result in a dish that falls short of your old, exacting standards”. With true British sangfroid, she urges us to make do and mend. “You must have forgotten how good things taste when cooked in butter. Continue to forget, and use instead margarine or margarine mixed with lard.” Those were the days! Then she gives us some suggested menus, with quaint titles such as Luncheons for guests on whom a special effort is not wasted (cold mousse of eggs, duck with turnips, purée à la Jane); A dinner to please your husband who has invited business friends and wants to impress them (Batavia frappé, chicken à la king, salade andalouse, raspberry ice); Little dinners for the girl who lives alone and has a guest (Eggs à la bonne femme, boeuf Stroganoff, camembert in aspic – whaaaaat??). As for the recipes, there was no Delia in those days. No glossy photos, and usually there are no quantities of anything, except for cake or pastry recipes – just a list of ingredients. The author assumes you already know how to cook from scratch, so most recipes are very short, with just basic instructions. 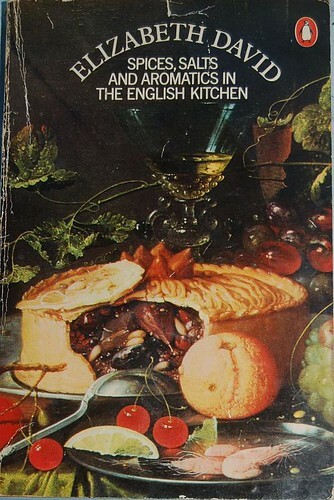 Though indubitably British, they are also very foreign to modern tastes; there were quite a few I read several times and just couldn’t visualise what they would be like (on the other hand, it’s perhaps a good thing that I can’t imagine what camembert in aspic is like). A dish called panna consisting of cooked spinach, hard-boiled eggs, sardines, anchovies, and butter, all pounded together, sieved, spread out on a tray, and then cut into rounds and served on ice had me scratching my head too. Apart from aberrations like these, it’s clear that in general British food in the 1950s was much blander than modern food. Or to put it another way, “things taste of what they are,” as Curnonsky famously said. Very few herbs and spices are used, and certainly no Asian ingredients. Naturally there are a few mild curries, and other dishes are given a bit of zing with nothing more exotic than mustard, anchovies, horseradish, or chutney. So, something simple for pre-dinner nibbles: Parmesan fingers, courtesy of Mrs Winston Churchill, no less. Very easy to make: you just cut some stale white bread into finger-sized pieces, soak them in cream as if you were making pain perdu without the eggs, and then roll them in a mixture of finely grated Parmesan and black pepper. In the spirit of wartime substitution, you can use Gruyère or Cheddar instead. Then arrange on a greased baking sheet and bake in a hot oven for about 15 minutes, turning once, until both sides are nicely browned. I used not-very-stale sourdough baguette, whereas I think the recipe assumes factory-made white sliced, so my “fingers” came out looking rather messy. But they were very good eaten piping hot, creamy on the inside and crispy on the outside. I’d do these again. Then cream of carrot soup. This is a prime example of 1950s blandness. It was a lovely pale apricot colour, and tasted of carrots. Which is OK I suppose, but nowadays you would have to perk it up with coriander, ginger, or orange. The geography of the dish I chose for the main course seemed a bit amiss. Brazilian Stew (or Goulash, in Hungary) it said. Well, they are both foreign I suppose. It wasn’t much like any goulash I’ve ever had, because there was no paprika in it, at all. 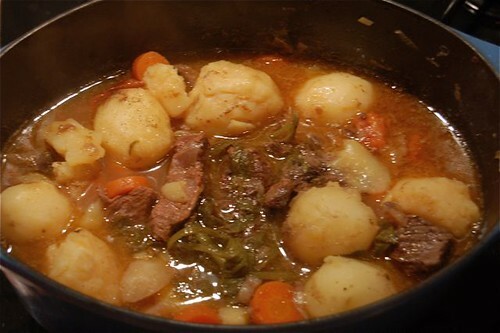 It’s basically a very British beef stew, with winter vegetables (potatoes, carrots, onion, a turnip), tomatoes, and beef, which for some reason is dipped in vinegar before adding it. I think this might be considered to be an adequate substitute for wine. No other liquid at all, except what comes out of the ingredients themselves. It’s supposed to stew “at the back of the fire” for three to four hours, so I put my big cast-iron cocotte on top of the woodburner, pouring some cold water into the concave lid so that what liquid there was inside would condense and drip back down onto the meat. Result: lots of excellent gravy. Again, I think it could be enlivened with some more seasonings: a smidgin more vinegar, some Worcester sauce – heck, you could even put paprika in it and call it goulash! 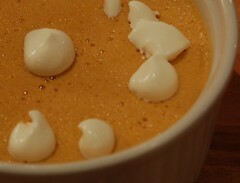 Pudding: with 1950s English cuisine, it had to be jelly. Well, soufflé froid au caramel actually. This must be a pre-war recipe as it is rather extravagant with eggs. It is made in the same way as you would make zabaglione, only without the marsala – whisking eggs and sugar over hot water until thick and creamy. Then some caramel and gelatine are added and you pour it into a soufflé dish to set. Unfortunately my dish was a bit big, so I couldn’t do the paper collar thing to make it look as if it had risen above the top of the dish. Instead I just put it in the fridge and hoped for the best. It tasted good, except that it separated as it set, so I ended up with a dense caramelly bottom layer and a fluffy top layer. If I made it again, I would do it in individual moulds as it looked a total mess once it was dished out. All in all we enjoyed this meal; nothing was startlingly good, but it was plain, wholesome stuff, made with ingredients that are all cheap and easy to obtain. I can definitely envisage making the Parmesan fingers again; really easy to do with ingredients you are likely to have on hand. My adaptations of the other two recipes follow. Just because you can’t always have plain roast chicken — this is nice for a change, and turnips done this way are delicious. Américaine, armoricaine, who cares when the sauce is this good? I wouldn’t smother lobster in this, but I find monkfish on its own a bit dull. This sauce is anything but dull; I don’t think the cream is conventional, but it smooths out the acidity of the tomatoes and gives an extra unctuousness. Steve adapted the first recipe he found when he went to marmiton.org and typed in “lotte”. And it was quick to make; we got home from work after seven, and it was on the table by eight. This sauce would work well with other firm fish/seafood; I can imagine it with squid, for example. Monkfish is on the expensive side, but you do sometimes get tails relatively cheap.